Attractive and comfortable chalet with sauna and open fire-place, situated in the outskirts of the ski village St. Martin de Belleville with a beautiful panoramic view. From here you can start directly into the entire Trois Vallées skiing area. The cosy village with the traditional village center around the church and its close lanes offers a wide range of Après ski taverns and restaurants. Built in the traditional Savoian style with natural stone and wood, the Chalet has a very special flair. After a busy ski day, the comfortable sofa corner at the open fire-place in the friendly living/dining-room invites for easing in. All beds in the bedrooms have a length of 2,00 m. A part of the lower floor of the Chalet is not available. 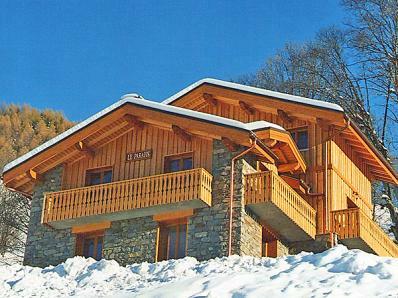 Chalet altitude ~1.450m; top of the ski slopes 3.200 m with glaciers; 600 km of alpine slopes, 172 ski lifts; skiing from approx. end of November until beginning of may (area Val Thorens) possible.